grink is a modern peer to peer application that helps you to collect and keep track of money from a group of friends. Simply create your group, request funds, and oversee payments. You can finally ditch that spreadsheet and collect with ease! 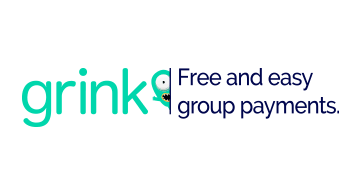 Better tracking and group transparency | grink allows you to save time and easily know who has and hasn't paid. No more manual excel entries or lost funds. Easier payment options | Users choose their own payment method directly in app including checking accounts, credit card, or "Pay over time" using financed payment plans. No more IOU's or harassing your friends to pay you back. Let them pay on their own terms. Create a group for ANY reason | Road trips, roommates, club & organization events, fraternity & sorority dues, fantasy sport leagues, vacations, and more. Your group, any reason.